Adobe Integrated Runtime (AIR) is a cross-platform runtime environment for building rich Internet applications using Adobe Flash, Adobe Flex, HTML. Adobe AIR can be installed and used on any platform for e.g Windows, Mac OS X & Linux. Installing Adobe AIR apps is quite easy as you only need to download and save .air file and double click to open with Adobe AIR for installation which also provides option to uninstall if you want. However If you install an AIR application from its source without saving its installation program file, or if the AIR engine is not available, uninstalling an AIR application can be difficult on a GNU/Linux system because it requires the use of system commands via a shell. 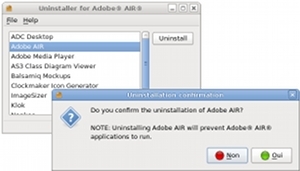 Here is solution for this, Uninstaller for Adobe AIR 1.0.0 which lets you to choose installed AIR applications from a list of installed applications and click on an Uninstall button. Uninstaller for Adobe AIR is a free software under GPL version 3 license, designed to compatible with the GNU/Linux Ubuntu distribution and with the GNOME and KDE window managers.